The key to inheriting birthright citizenship is being subject to the jurisdiction of the United States. Foreigners are subject to the jurisdiction of the countries they are citizens of. We deport illegal aliens back to the countries that they are subject to the jurisdiction of. If they were subject to the jurisdiction of the United States, then they would have all privileges and rights that go with that jurisdiction including voting, enlisting in our armed forces, and running for public office. Not being part of our jurisdiction, they are ineligible. They can do so in their home countries. The Supreme Court held to this in the 1884 Elk v. Wilkins case. They decided that the children of foreign ministers were not granted birthright citizenship based on the fact that they weren’t subject to the jurisdiction of the United States. An American Indian was not granted citizenship, because his parents weren’t completely subject to U.S. jurisdiction, being also subject to an Indian nation. If an American Indian was not granted American Citizenship by birthright after the 14th Amendment was ratified, then we can certainly conclude that birthright citizenship isn’t granted to foreigners by the 14th Amendment. Congress didn’t grant citizenship to American Indians until 1924! Wong Kim Ark was a Chinese man who was born in the United States to Chinese citizens. They returned to China and took little Wong with them. Eventually Wong wanted to come back, but he wasn’t allowed due to the Chinese Exclusion Act of 1862 that prohibited all immigration of Chinese laborers to the United States. Wong sued and his case went all the way to the Supreme Court and they pulled a rabbit out of their hat and said that the 14th Amendment granted him birthright citizenship, which it clearly doesn’t. The Supreme Court often misinterprets the Constitution, which is why the founding fathers did not give them the power to interpret the Constitution to begin with. They purposefully left judicial review out of the list of enumerated powers that the Constitution authorizes the courts. The Supreme Court usurped this power in Marbury v. Madison and it hasn’t yet been properly challenged. I have my hopes. Now that Won Kim Ark was granted citizenship based on a misinterpretation of the Constitution, the other unconstitutional power of the Supreme Court kicked in, which is to set precedent, effectively legislating a new law. Now it applied to all babies born on U.S. soil. This went on until 1965 when it was no longer good enough to liberals to merely give birthright citizenship to the children who were born in the U.S. No, liberals wanted this birthright to extend to the family of the baby. Congress passed the unconstitutional 1965 Immigration Act. This gave birth to the term “anchor baby.” Listen carefully to those on the left like Jeb Bush who keep saying, “If you’re born in this country, you’re a citizen!” They are deflecting the issue. 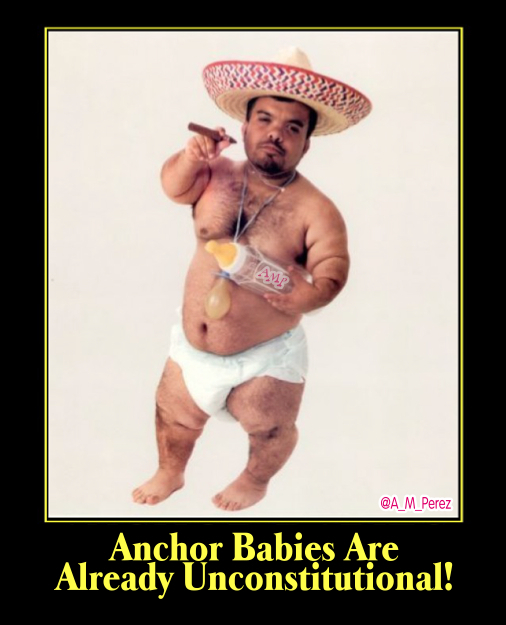 The term “anchor baby” has nothing to do with the citizenship of the baby. It’s far worse now. The baby is granted birthright citizenship straight out of illegal alien womb and instantly legalizes the alien who birthed it. The baby anchors the mother to the U.S. with a green card. It keeps getting worse, because the chain on this anchor has gotten longer and now applies to a growing list of extended family members. When an illegal alien squeezes out a kid on American soil now, the kid is holding a bag of green cards for the whole family waiting on the other side of the border. Even if you are stupid enough to believe that the 14th Amendment grants citizenship to any baby born on American soil, it’s asinine to assume this extends to the entire family. Granting birthright citizenship to the baby of an illegal alien is unconstitutional enough, but the 1965 Immigration Act is borderline treasonous. Always question the constitutionality of any law that Congress passes. Most are unconstitutional. If they pass a law called an Act, you can safely bet your house that it’s unconstitutional. The Gun Control Act and The Civil Rights Act are just two more of many unconstitutional and dangerous laws that Congress has passed. They always do it under the guise of being caring and yet they always infringe our liberties and/or sovereignty. There is no need to ratify another amendment to get rid of birthright citizenship, because it doesn’t exist. We merely have to stop applying unconstitutional Supreme Court decrees to the populous. They can’t legislate. All we need to do is read the 14th Amendment and follow what it actually says. This is not to say that I wouldn’t love to see the 14th Amendment repealed anyway. There are other reasons that I want it repealed, which I cover in more detail in my E-Book. Previous Vote Now! Republican Primary Poll 3! Next How Tolerant is a Gay, Black Lives Matter Racist? It’s very similar to the interpretation of the second amendment. You hardly ever hear anyone quoting the first half, “A well regulated Militia, being necessary to the security of a free State”. They only cite the second half, “the right of the people to keep and bear Arms, shall not be infringed.” There is no longer a need for a militia. That’s what the National Guard is for. Unless someone is planing to start a militia to overthrow the government, I don’t know why the insist this amendment is even valid. It is obsolete. There are hundreds of militia. The National Guard is not the militia, nor it’s replacement. You can even call them and ask them. They will confirm what I am saying. No amendment is obsolete unless it is repealed. The 2nd Amendment is the most important amendment as it protects the rest. Yes, FROM THE GOVERNMENT. Do you not learn from history and see what happens when governments disarm the citizens? Do you not know that gun control is what started the Revolutionary War? What is it about being ruled that you love so much? What is the thing about liberty that you hate the most? Because some people are born on our soil whom we do not have jurisdiction over, such as babies born to diplomats. They have what is called “diplomatic Immunity” which means they do not have to abide by our laws because they are not in our jurisdiction even though they are on our soil. Why are you, or I, a citizen? Because we were born here and subject to the jurisdiction of this country at the time of our birth, just like every baby born here with a few exceptions. This is pretty standard practice in most countries and the reason we have dual citizenship. Indian were born in their sovereign lands which just happened to be taken over by the U.S. at a later date. It would be like if we invaded Mexico and forced it into statehood. All those Mexicans would then become U.S. citizens. Even if that makes you sad. When we took over all the lands from the Indians we had to make them citizens. The ignorance of the author is stunning. I teach the History of US Constitutional Law at several universities and were he a student he’d have received a “D-” on this work. Try reading DEMOCRACY REBORN by Epps to begin with. Next move on to NO STATE SHALL ABRIDGE by Curtis. Perhaps this will do something for your ignorance. It won’t do a damn thing for your inherent racism and hatred though. Obviously YOU are the problem. If you teach anything at all about the Constitution, I feel sorry for your so called students. For instance, you want us to read “Democracy Reborn,” yet we are NOT a democracy. My God, the abject morons they hire as teachers these days appalls me. Racist? I challenge you to explain what I have said that is racist. Your race card is expired. It no longer works. Give up that tired ploy. I love how you teach at “several” universities. That says you’re a substitute teacher. You can’t get a job with a single university as a professor, because you’re too inept. In other words, you’re a babysitter. Our Founders’ intent was to protect America from foreign nationals, whose motives and agendas may not be in the best interest of our Republic, obviously the most glaring example being the current illegal occupant. If you want the truth from a Constitutional scholar, watch this short video. The plain meaning of the words of the 14th Amendment do grant citizenship to anyone born here. Read them for yourself. It is only through “interpreting” what those words mean by looking at the historical facts surrounding its passage and what the drafters intended that we can come to the conclusion you argue. I have read them. Did you read my article? The words DO NOT grant citizenship to foreigners plopped out on U.S. soil. They aren’t subjects to U.S. jurisdiction. If the wording granted citizenship to anyone born on U.S. soil, explain why it didn’t start doing it the day the A14 was ratified. I can tell you why. Because that’s not what it says. Ask the American Indians, who weren’t granted citizenship until 1924. Yes. “They subject to U.S. jurisdiction.” That’s my point. What does that mean? You necessarily need to “interpret” what that means in order to arrive at your conclusion, which, by the way, I agree with. The plain, simple words “subject to US jurisdiction” are not black and white clear. “Subject to US jurisdiction” is amenable to different interpretations. Think it’s clear such that any normal everyday person can discern the meaning? Ask ten highly intelligent people of your own choosing who are not already biased one way or the other on the issue of anchor babies to read the 14th and then ask them if it would apply to anchor babies. Do you think you’d get unanimous agreement that it does not apply to them? Really? Do you think anyone would not ask, “Well, what does subject to the jurisdiction mean?” That’s because it isn’t clear without resort to additional information. Even you, above, went BEYOND the simple text of those few words to explain it. And that’s my point. You can’t simply say “Subject to US jurisdiction” and arrive at your conclusion from the plain meaning of those few words without resorting to the INTENDED meaning and HISTORICAL context. In other words, you must INTERPRET. Yes, the words “subject to U.S. Jurisdiction” are black and white clear. If everyone in our borders is already subject to our jurisdiction then what is the clause needed for? It’s needed, because not everyone is subject to our jurisdiction and it is intended to ensure that only those who are, have birthright citizenship. Illegals aren’t. You are subject to the jurisdiction that you are a citizen of. British subjects are subject to the jurisdiction of the United Kingdom. There are no interpretations that would suggest that everyone in the U.S. is subject to our jurisdiction, or that subjectivity would already be a given, thus the clause would be unnecessary. So yes, I can simply say, “Subject to US Jurisdiction” and know precisely what it means and anyone who isn’t intentionally trying to avoid the meaning, can do the same. Keep reading, as well. The state in which they reside. I’m sorry, but no illegal can legally reside in any state. They reside in their home country. If I break into your house, I don’t reside there. Oh, keep reading even further to Section 5. CONGRESS, not SCOTUS can enforce this Amendment, so the 1898 SCOTUS decision is null and void on its face. Again, I agree with you. The 14th Amendment does not grant babies born here automatic citizenship. Where we disagree is whether one can arrive at that conclusion without resort to information EXTERNAL to those few words of text. Interpretation. YOU know exactly what it means BECAUSE you already know the intent and historical context of those few words. But you are saying that the words themselves, in the absence of any knowledge of the intent and historical context and without resort to questions about those things clearly and in black and white fashion, mean that a baby born here is not subject to the jurisdiction of the US. Again, that phrase is not clear. You are saying the baby is not subject to the jurisdiction because the parents aren’t. But the parents are! They can be searched, arrested and prosecuted for violation of federal laws. Strictly speaking, they are subject to US jurisdiction. Do you deny this? Hint -Twenty five percent of the inmates in federal prisons are illegals. You cannot be prosecuted for a crime unless the court can exercise jurisdiction over BOTH you and the subject matter of the action. So, again, you must know the intent and historical context to interpret the meaning of the 14th amendment as it relates to anchor babies. And if it is challenged one day in court, you will see EXACTLY that. Again, it’s easy. The clause wouldn’t be there unless it meant SOMETHING. If all who are within our borders are subject to our jurisdiction, it would not have been needed. We also have the author of the clause who told us that it doesn’t mean foreigners. We also have 30 years of precedent after the amendment was ratified where it did not get used the way it started being used after SCOTUS rewrote its meaning via legislation from the bench with case law. Unconstitutionally wielded SCOTUS power. Completely usurped. Then we have the Indians. If is means what people incorrectly think it does, it shouldn’t have taken 56 years to grant citizenship to the Indians. There is absolutely nothing that suggests that it grants birthright citizenship to illegals. Not history, not the text itself, and not anything I mentioned above or in the article. That said, I still want the amendment repealed for countless reasons, which I cover in my ebook. Trump was the first to question this. THAT’S why people are listening. True. He’s on the right track. I just wish Trump would educate himself on the Constitution, so he’d know why he’s on the right track and could discover that the Constitution actually backs him up. He doesn’t have to say things like, “Well, some lawyers say we might be able to change this.” He could say, “It’s already FLAT OUT UNCONSTITUTIONAL!” and then explain why. I’d love for him to hire a Constitution Coach. You sweetheart, you! You can make Trump the Man with the plan with the Constitution. I am waiting for one person in authority to challenge the misinterpretation of this insane policy. Are you saying that illegal aliens are not subject to our laws because they are not under U.S. jurisdiction? If they are subject to our laws then the 14th Amendment applies. If they are not subject to our laws then they are free to do as they choose. You cannot have it both ways. Indians were not citizens at the time because they were not under US Jurisdiction, it was not until we had forced them into Citizenship and reservations that they came under US Jurisdiction, which may not have been Constitutional either. And of course foreign diplomats have had immunity and are not subject to US Law, but illegal aliens, yeah they are under our law, our Jurisdiction for good or bad. Being subject to our law is not what makes someone subject to our jurisdiction. Every illegal is breaking U.S. law when they step over the border. If Indians broke the law, they were put on trial and convicted like anyone else. They weren’t immune to laws. Illegals are not subject to our jurisdiction any more than Indians were. They are subject to the jurisdiction that they are citizens of. But being subject to our laws is what jurisdiction means. When an alien jumps a wall, swims a river or sneaks in by some other way they have entered our jurisdiction illegally and are then subject to our laws including entering our country illegally. Are you saying they can claim they are under the jurisdiction of their home country and don’t have to follow our laws because they are not in our jurisdiction? Either they are in our jurisdiction and subject to our laws, or they are not. Pretty straight forward and simple to understand, I think. You keep coming back to the Indians. But the Indians had sovereign states here, that we slowly stole from them. So they were not born as citizens in many, but not all cases, because they were not part of the US but their own state. It was not until we finally claimed the whole land from coast to coast as ours did we have to deal with giving Indian citizenship. No it doesn’t. If that is the case, why have the clause. If EVERYONE born on American soil is in fact subject to our jurisdiction, why clarify the Amendment to make it applicable only to those who are subject to our jurisdiction? People are subject to the jurisdiction of the country they are citizens of. That is simply the way it has always been. That’s how it was defined when the amendment was written and that is still how it is defined today. Even if it makes you sad. You admit Indians came from sovereign states. So do Mexicans. Somehow you are missing that point.